Napa Valley is not bereft of beautiful sights and delightful activities. They are so many choices that you may be led to think “What to do in Napa?” It’s pretty understandable as many of these activities bring a unique experience to guests. If you’re particularly a lover of wines but at the same time you want something out of the usual wine tours, there are many wineries that will leave all of your senses lingering, not just the taste. Arrive in style at the Sterling Vineyards (in Calistoga) with a ride inside a cable car that offers you breathtakingly lush scenery as well as the access to its hilltop winery. As you step past the gate, you will be greeted by Mediterranean-inspired architecture with stark white stucco walls and enchanting vistas of the valley. Even if you’re not a drinker, you or the other guests will definitely enjoy at the Sterling Vineyards as well as other wineries that offer other attractions. Some of these are their amazing art galleries and architecture. If you’re into art, you can visit many wineries in Napa that also function as galleries. These include Artesa Winery and its glass sculptures and installations (by resident artist Gordon Huether), Mumm Napa’s on-site gallery of Ansel Adams’ photographic works, Cliff Lede Vineyards’ garden bedecked with sculptures, Silverado Vineyards’ interesting vintage poster collection. You can find art even in the streets of downtown Napa as it stages a city-sponsored biannual event called Napa Art Walk, a rotating exhibition of sculptures by local and national artists; these sculptures are then assessed by a jury. If you want a unique dining experience in Napa, you might as well board the Napa Valley Wine Train, which also serves as a restaurant. These exquisitely restored vintage Pullman railcars run along a 25-mile track which passes through several cities such as Yountville, Rutherford, and Oakville. Admire the rich interiors and the dining tables of the railcars that make you feel as if you’ve stepped back in time. Napa Valley Wine Train serves up gourmet meals that are freshly prepared. If you want a unique dining experience in the Napa Valley Wine Train, dine in their two-storey “Vista Dome” with large, curved glass windows that allow you to see and appreciate picturesque sights of the Napa Valley while you’re having a nice gourmet lunch. Vista Dome is reservations-only areas so if you want to have the chance to dine there, book a seat in advance! Hot air ballooning is also popular in Napa. You may have seen these colorfully-designed balloons floating high up in the blue sky. 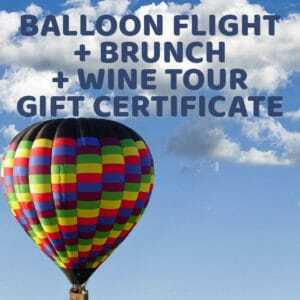 At some point, you also wish that you may be able to take a once-in-a-lifetime journey on a hot air balloon and enjoy the uninterrupted, panoramic views of the Napa Valley, particularly during sunrise. Balloons Above the Valley (BATV) allows guests to have this unique experience of flying over the gorgeous Napa Valley landscape at competitive rates. BATV’s packages feature pre-flight breakfasts, an hour-long flight, and post-flight brunch with a sparkling wine. Many of the packages also offer wine tours and limo bus transportation which will take you to the vineyards and wineries. You may also request in-flight photos or champagne flutes to take with you on your airborne journey. For sure though, you most likely won’t forget to take pictures of the neat rows of grapevines and the verdant hills and mountains that surround Napa’s deep valleys. The experience of flying alone just makes you feel like you’re on top of the world! This is a one-of-a-kind experience that you will never forget! These are only some of the suggestions whenever you ask the question “What to do in Napa Valley?” These suggested activities are considered some of the best ways to enjoy and appreciate what Napa Valley has to offer.